The International Space Station (ISS) may be the Space Age symbol of the classic adage – Where does an 800-pound gorilla sit? The comeback: Anywhere it wants to. The orbiting mega-facility has received a life extension through at least 2020, but eventually it will have to be decommissioned. So how to you deep-six a $100 billion space station the size of a U.S. football field? As part of its environmental impact responsibilities, NASA planners have begun delving into how to bring down the space station, dumping the huge facility into select, but remote, ocean waters in one fell swoop. The result promises to be an ultra fiery follow-up to the U.S. Skylab experimental lab re-entry in 1979 and the intentional downing of Russia’s Mir space station in 2001. Meanwhile, other experts are starting to advocate scavenging pieces of station hardware for other duties in space. In November, the second decade of human occupation of the station began. The orbiting outpost has also set a record for being the longest continuously inhabited spacecraft. About 15 nations have contributed modules and other hardware over the last 10 years, with 200 astronauts, cosmonauts and space tourists visiting the complex over that time. For right now, the International Space Station is headed for an extended stay in Earth orbit. arth orbit; and support future objectives in human space exploration." In an October briefing for the Aerospace Safety Advisory Panel Briefing – an independent group of experts that evaluates NASA’s safety performance – an "ISS End-of-Life Disposal Plan" was prepared by Michael Suffredini, NASA's manager for the International Space Station program for. This NASA chart depicts a potential disposal orbit for the International Space Station, a path that would send the huge orbiting complex plunging into Earth's atmosphere to crash into a remote ocean waters. g hazards and available options, given the space agency’s environmental impact obligations. According to the NASA document, the U.S. space agency has recently begun discussions with the European Space Agency over a dedicated de-orbit craft for use to help propel the space station into its ultimate watery grave. Similarly, NASA has begun initial chats with Russian space program officials to assess the feasibility of modifying the current unmanned Progress supply vehicles to be part of the station de-orbit planning. For a nominal de-orbit plan, the Progress space freighter is viewed as necessary for attitude control or additional thrust during de-orbit ahead of re-entry. Also on the table is using a combination of Europe's huge Automated Transfer Vehicle and Russian Progress spacecraft. The European ATV cargo ships are also unmanned cargo resupply vehicles, but are much larger than the three-module Progress vehicles. They are large enough to fit a double-decker bus inside. To set up the space station's re-entry and safely pull off its swan song ending, an estimated 9 tons of propellant would be required. According to the briefing charts, an early station termination plan has already been scripted. But that scenario would be set in motion only if a chain of unfortunate and unlucky events were to occur. For example, the plan would be activated only if a catastrophic event caused an early evacuation of the station, and; the space station cannot still maintain control, and; the event is also preventing additional vehicles to dock to orbiting lab. The chances of such a scenario occurring before the retirement and disposal of the International Space Station are extremely remote, but NASA keeps the emergency response plan handy just in case. The first response to an early evacuation of the station is to boost the orbiting lab to a higher altitude to give time to address the issue. Additional vehicles can be flown to either supply additional propellant to keep the station in orbit so that a plan to re-crew the outpost can be implemented. Additional vehicles can also be flown to execute the nominal end-of-life de-orbit plan. For former shuttle astronaut and space station visitor Tom Jones, the end of the International Space Station is not just a finale, but also an opportunity. He sees the possibility of repurposing part of the space station complex as tantalizing. 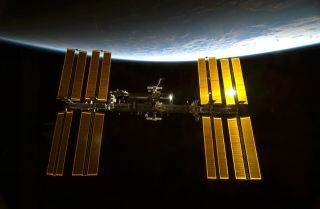 “Now that the ISS partners have decided to keep the outpost operating beyond 2020, I very much hope it’s used as a test bed for systems and technologies we'll use to explore beyond low-Earth orbit and the station,” Jones told SPACE.com. It’s Jones' view that the space station can serve as a “knowledge stepping stone” that provides needed knowledge to explore deep space. “When an end to the station’s useful life appears on the horizon, I truly hope NASA will figure out with its partners what parts might be recycled or repurpose,” Jones added. “I know NASA’s plans to send its explorers into deep space include power systems, habitation spaces, life support systems, labs, an airlock, and so on. I think NASA is wise to look into how practical it might be to choose still valuable ISS components and either incorporate them into a deep space vehicle, or even move some of the station into a place where it becomes even more useful to future exploration efforts,” Jones said. Jones said that NASA is well-aware of the space station's limitations inside and out after 10 years of operation.